The Community Action Plan has been produced using Planning for Real® methodology by and for the village of Findhorn, with the assistance of The Moray Council, Community Support Unit, numerous local individualsand organisations (www.planningforreal.org.uk). To see the results of the consultation, please click here. We are pleased to be able to notify our members that we have been successful in purchasing the Armstrong Garages off Seaforth Lane, Findhorn. A small amount of work needs to be completed before we can offer them for rent to our members and then the wider village. Details of the rental charges, the lettings policy, lease and other relevant information are now available on the "Garages" page of this site. We will therefore be writing to everyone in the Village to ask them for a loan repayable after 5 years tp help us maximise the potential. Once the loan and improvement works have been completed we will use the income for the garages to improve other areas of the village. See Garages page for a form. New newsletter out with update on current activity - see Newsletter tab. Accounts for year ending March 2017 available to view - click link below. This map is available for viewing by arrangement in the Village Centre office between 9 am and 3 pm. We are currently working on 4 different projects involving board members, volunteers and other village groups. Click here to see who is involved in which project. Hazel Allen of Athena Solutions gave a presentation of the findings of the Housing and Workshop Surveys. The majority of members were in agreement to move forward with the garage site acquisition. On the 3rd March 2016 the Company TFVCC took ownership of the Novar Estates residual land in Findhorn. The Board would like to invite you to a celebratory cheese and wine evening on the 8th April 2016 in the James Milne Institute at 7.30 pm. There will an opportunity to view the maps of the land, bay and foreshore. This event is open to members, associate members and anyone who has an interest in the future of the village. The purpose of the meeting is to highlight the achievement and to update you on the company progress and plans. The Board of Directors would like to thank all who have supported us through this challenging process. We hope that you are pleased with the outcome. The continued success of the company is dependent on a strong membership and ongoing consultation. Membership application forms will be available at this meeting, but can also be obtained at any time from the Company Secretary at the address below or by downloading here. 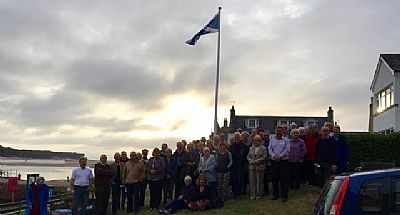 The Scottish Land Fund has announced financial assistance to The Findhorn Village Conservation Company, in Moray, to take forward its plans for community ownership of part of the Novar Estate Holdings. Thanks to a grant of £520,000, the community are now one step closer to owning the holdings which includes 61 hectares of amenity land within the village of Findhorn, and 800 hectares of the foreshore and intertidal land adjacent to the village. The First Minister recently announced the Scottish Land Fund will treble from £3 million this year to £10 million a year from 2016. This will make it easier for communities around Scotland who are interested in owning their land collectively to do so. Further to the above announcement from the Scottish Land Fund the Board of Directors would like to thank all who have supported us through this challenging process. We hope that you are delighted with the outcome. The Board would like to invite you to a public meeting on the 25th March 2015 in the James Milne Institute at 7.00 pm. The aim of the meeting will be to update you on progress and to celebrate this achievement. There will an opportunity to view the maps of the land and foreshore. The continued success of the company is dependent on a strong membership and ongoing consultation. We would encourage those of you who are not members to join as this will enable you to vote on the future of the Company. Membership application forms will be available at the meeting, on the website here, or from the Company Secretary - Marjory Barber, at the address at the bottom of this page. We would like to thank all who have made pledges. We will provide details on how the pledges will be processed and collected later. As the land has been valued independently by the District Valuer at £575,000, if you have not already made a pledge and would like to do so please see the relevant information under the heading Community Buyout - Urgent Appeal here. Click here to read the article featured in the Forres Gazette in November 2013.